Together, J.D. 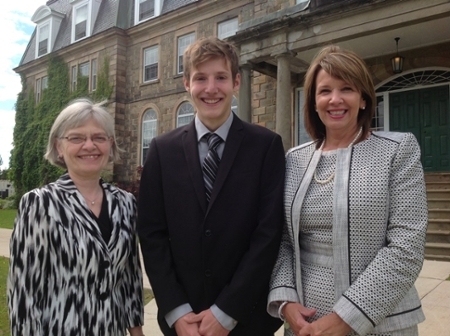 Irving, Limited and the University of New Brunswick presented the first JDI NB Scholarship to 18-year-old Jacob Wall of Waasis, N.B. The $32,000 scholarship is one of two renewable awards for incoming first-year UNB students. It is valued at $8,000 per year for up to four years of study. The scholarships are funded from a $1-million gift made in 2007 by J.D. Irving, Limited to UNB that will allow the most talented students to fully apply themselves to their course work and to better prepare for their future careers. "Supporting bright and hard-working young people is an investment in the future of New Brunswick," said UNB President Eddy Campbell. “We deeply appreciate JDI's generous support of our students through this scholarship program." UNB has been a partner of JDI for decades, developing talent in New Brunswick, and the results are impressive – today there are more than 600 UNB grads working at JDI. For more information on the JDI NB Scholarships visit.